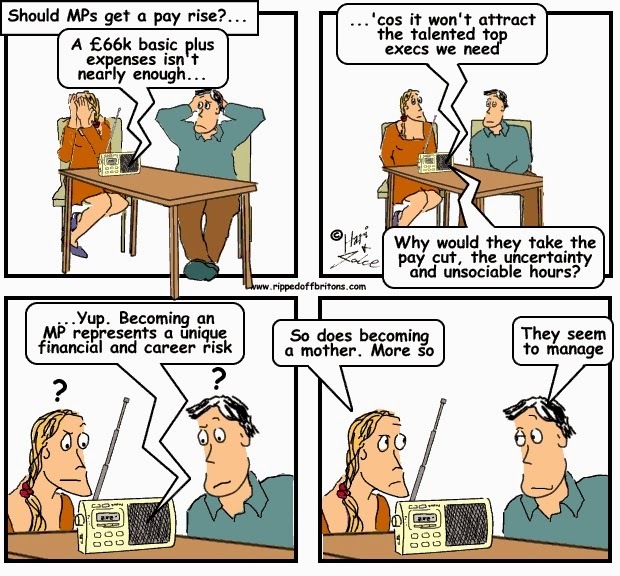 Graphs at a glance - Do we deserve MPs who are paid more? One almost has sympathy for our MPs. 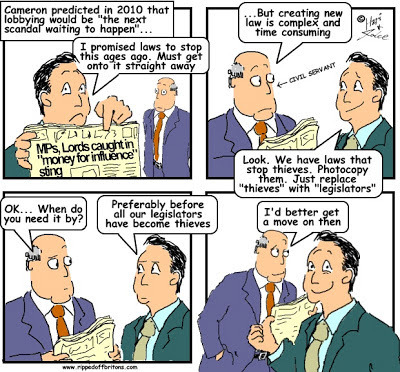 They are being tantalised mercilessly by IPSA waving wads of cash at them. IPSA's proposed pay-hike is as cruel as leaving a diabetic Billy Bunter locked in a dorm with a plate of lemon meringue pies and lashings of ginger beer. Shame on you IPSA! Is this revenge for when all but one of your predecessors were de-facto sacked in January 2013 for refusing to be MPs' doormats? Though we do appreciate the black comedy of MPs protesting through clenched teeth "I couldn't possibly". They, and we, know that in Parliament MPs just do as the whips instruct them. They serve up their votes to order with the same level of contemplation as a hotdog seller handing out hotdogs. They are chosen not by the electorate, but by schmoozing up to tiny bands of 'swivelled eyed loons' on constituency selection panels. They are already paid more than 95% of Britons, not including their expenses. Their expenses have grown wildly faster than inflation in recent decades. 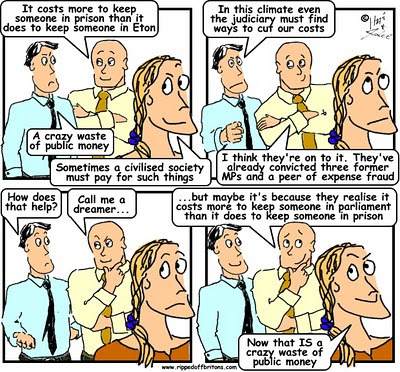 A quarter of MPs employ family members on salaries upto £45k. Much of the UK is covered by 'safe seats' that haven't changed hands in decades, according to the Electoral Reform Society. Most of us don't even know the name of our MP. Fewer than 1 in 5 of us have ever bothered to find out anything about them. Fewer than 1 in 10 of us has ever seen our MP speak at a local event. "The package we will announce on Thursday will, taken as a whole, not cost the taxpayer a penny more. That message has not been heard in the hubbub of the last few days. Once it is, I am hopeful that our reforms will receive the same thoughtful response that we found in our polling. And that some commentators will pause before making sweeping assumptions about what the public think without asking them." MPs are already happy to waive their principals in their party's interests. 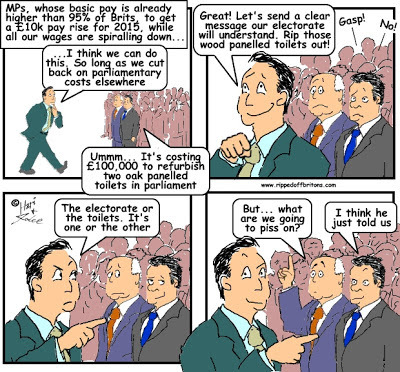 They are already paid more than 95% of Britons. Paying them even more will just make them even more dependent on sucking up to their political masters, rather then representing their constituents. The warier MPs should see IPSA's generous proposal in the light of Mark Antony's funeral oration for Julius Caesar. Is IPSA payrise to praise them or to bury them? There is also the issue of MP’s who only represent their party not their constituents - shouldn't they be paid from party funds not the tax paper? You could argue they should be paid the national average wage, then they would see how the average person has to live. They should not employ a family member on more than the average UK wage. They should not be allowed to have a second home which they own. the state should put them up in flats around London and they should pay towards the costs of utilities and food like anyone else who has to work away from home minus any tax allowances for their expense. Why should they be different to the rest of us? 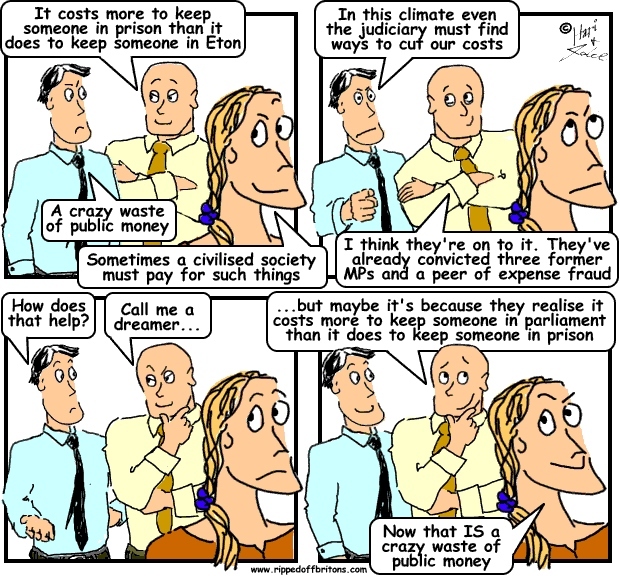 They should not be able to have any other paid work, Police i believe aren't allowed too, so why should MP's. Yes let them write articles , books etc but they should not be a director of any company which is a conflict of interest to their independence and to their time. They don't represent us the electorate just business and the rich elite who they don't tax or control, the opposite of how they treat the working person. They say we need to pay more to attract the 'top people', what they mean is friends of the rich, media, zionists, paedophiles, bankers, directors of businesses, tax avoiders and non domiciles. Yes we need clever people, but we also need them to have common sense which very few seem to have when bills in Parliament constantly need changing because they didn't get it right first time. In business if you don't get it right first time you lose business, lose money and even lose your job, but these muppets continue to milk the system when they constantly get it wrong. Where is their productivity information?